Check Out YWAM LA's Video! Becca Prins of YWAM Los Angeles whipped up this really sweet video of their MA program. They've been using it to recruit teams and volunteer staff for their program this year… See that? You could create something similar that's specific to your ministry this year, so that you can recruit teams and staff for next year! Check out Ensenada's Exhale Inhale Set! So I'm down in Ensenada visiting our Mission Adventures team. Spring Break outreaches begin in nine days and they are putting the finishing touches on their complete re-design of the lecture hall. Here are a few photos to inspire you! Look at the scale of this project! This set is sure to wow all the students who come to Ensenada! That lettering is at least nine feet tall! Despite the large scale, this is actually pretty easy to make happen. All you need is the Exhale Inhale Art, a projector, and some paint! If you don't have the Exhale Inhale Art, you can get it here! 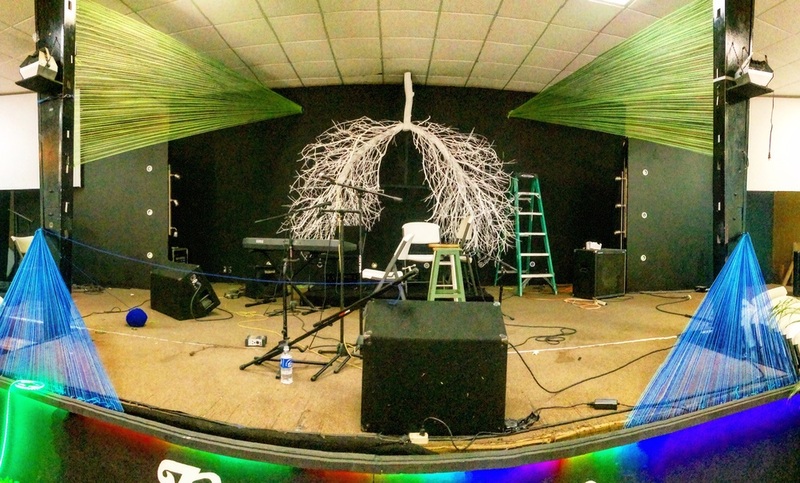 The stage features a ginormous set of lungs made of tree branches. Again, this is a simple and inexpensive concept. Yet it all comes down to execution. What you may not see from the photograph is how many screws are holding this together! As you can see, they're doing an incredible job! Today they are stringing Christmas lights above the seating area and finishing up a lot of the details. By the time the students get here, this space is really going to wow them! You may be thinking, "But I don't have a whole crew like they do in Ensenada!" That's okay! You don't have to do what they did! Instead, lean into Jesus and dream with him what you can do, and do that! You'll be glad you did! We started our time together with a challenge to be real, honest, and transparent with one another. At first, this seemed like something very easy for us to do because we have all known each other for many years. But then we were challenged with the idea of what it means to really know one another. It was good to consider this and see that God is calling us to a deeper level of friendship and intimacy with each other. Each of us was given a stone and then asked to consider the Pacific Ocean. If we are the stone, and the ocean is the Word of God, where do we want to be? It was obvious to us that we spend far too much time on the shore only occasionally getting wet. We felt a clear call to spend more time reading and meditating on the Bible as well as practicing the presence of the Word himself. We discussed the time Jesus told the disciples that in order to be a part of the Kingdom it's necessary to become like children. It was clear to us that even as adults, we find ourselves acting child-ish, instead of child-like. We found it interesting that Jesus made this distinction when the disciples were concerned about their position. This is a clear call to us to create a family-like circle that's based on pure relationships and not on position, authority, or power. We finished our time together by celebrating our diversity. We took time to share with each other the different gifts we see in each other. It wasn't really a surprise that we didn't have enough time to even finish this. However, the takeaway was that as we grow closer together to God and each other, we will have a greater appreciation for the strengths, gifts, and callings we see in each others' lives. Of course, the iMAC included lots of other discussion, but we think a main theme of our time together was to create the kinds of relationships where candor, trust, and even love can abound. And it's in this kind of environment that God somehow extends covering through us to our Network around the globe. In the same way, we encourage you to create these kinds of relationships in your teams and circles where you are. Exhale Inhale Speaker Notes Are Here! A whole crew of theme teamers worked super-hard to bring you an amazing resource that can really help your MA sessions come alive. They've developed comprehensive, session-by-session notes to help unpack the deep meaning of this year's North American theme. Seriously, their work makes your session planning and your speaker's preparation so much easier! Visit the Exhale Inhale page to download this super valuable resource! Anders made a simple point during our morning devotion that resonated with us all. He said, “We tend to compare our weaknesses with others' strengths.” We recognized ourselves in this statement, even though we've been believers for many years. It kills us when we compare. It makes us feel as though we’re not enough, and that we’ll never be as good as those we compare ourselves to. It shuts us down from being confident in whom we are and causes us to shrink back. And we recognized that it's tempting for us to compare ourselves to one another. Anders went on to make the point that instead of comparing ourselves, we are designed to celebrate each other's gifts. And when we do that, we create room for one another. We build each other up, and we function like the full body. Today we discussed the topic of eldering, and how part of the role of elders is to come alongside one another and operate in unity. Almost instantly, we had the opportunity to put into practice what we were talking about. One of us is walking through a difficult leadership challenge. We prayed, gave counsel, and offered support and help. Not that these situations are the easiest, but it was amazing how we talked about a principal, and then had the opportunity to live it out. Please Join Us in Prayer! Please join us in prayer from where you are. A list of prayer points will be emailed on Monday the 15th—(sign up at the bottom of this page if you haven't already!). And when you pray, ask God for words, impressions, pictures and visions. Whatever he shares with you, please feel free to post in a comment below! Thanks so much, stay tuned! Ouuuuu, lookie! All the arts for the Exhale Inhale Theme! We've put together an amazing downloadable package of the Exhale Inhale theme art that you can use to enhance your program! The pack includes the art from the tee shirts, the stickers, and even the cool MA interlock logo that's on the label from the backpack. In addition, we've whipped up some HD screens that are perfect for using in presentations/teaching times/worship times. Literally hundreds of hours have gone into producing the art for the theme, and we're pleased to offer it to you on the MA Gear store. Please Note: This art is governed by a license agreement that does not allow you to make a for sale product, (ie tee shirts, mugs, hats, etc.) If you'd like to license the art to produce your own Exhale Inhale merch, please contact us for more information. Exhale Inhale Playlists from Heiko! Heiko from YWAM San Francisco has put together two awesome Spotify playlists for us that are specially tuned for our theme! Check 'em out! More free resources will be added to the Exhale Inhale page soon, so stay tuned! It's that time of that year; MA Gear ordering!! Wahoo! The gnomes in San Diego have been working hard over the past few months to get everything ready for the next MA season. Back when I led Mission Adventures in Las Vegas, I was always excited to see what the new design was for the year and I couldn't wait for the students to get them! Not much explanation needed here ... dozens of people have put endless hours into this years theme and design. The t-shirts are super cool and stylish and it's not a YWAM function if lanyards/name tags aren't involved!! Many of our teams are returning teams; whether that's to the same base, or another one. It shows that we as YWAM are a group of people working together for the purpose of training up young missionaries. Students will wear their new backpacks and t-shirts to school and they will start conversations. Friends will ask them what it means or where they got it, and it's a great opportunity for them to share about their mission trip and Christ with people. Whenever I look at my pile t shirts from past MA themes, I'm reminded of the memories of that season - the people we shared with, how God brought transformation in my life and those around me. It encourages me to keep true to the things that God spoke to me during those weeks. With our MA teams, we aren't looking for them to have just an 'experience' or a 'fun time', it's about transformation and change. The journal is such a great way to encourage students to continue on and go deeper with their walks with God. It's an effective tool for their personal quiet times and will encourage them! Thera are so many more reasons!! So if you're on the fence on whether to order or not, you really should. This is a tool that is available to you that needs to be used. Maybe you think you can do it cheaper or could go with out, but I have always seen the MA Gear as a priority and important tool for our students!! Can we really afford to not use this resource? It's so much more than a pen, sticker or a t-shirt!! Okay so go put your order in and get excited to receive your packages shortly!! Here's a quick look at the direction that the design work for Exhale Inhale is taking. Think ornate lettering and lots and lots of line work… Sharp eyes will spy what looks to be an MA interlocking logo, and is that a vintage MA Waves 2011 mug?? Here are some 1, 2, and 3 color concepts for an interlock style Mission Adventures logo. We love how the 'M' and the 'A' interact and overlap! There are still a few niggles that need to be solved, but this bad boy will likely make an appearance on some spiffy new MA Gear for Spring '16! Hand drawn is where it's at! Jamie of YWAM Ensenada is in the Mission Adventures Studio this weekend. She's hard at work developing some amazing hand-drawn lettering concepts for our next theme. We are keeping the design real by doing as much work as possible with pen and paper before bringing it into the digital realm. As you can see,this is really coming together. You and your students are going to love this stuff! Announcing the 2016 Theme for North America! I'd like to thank Dallas; Dan & Carolyn, Ronnie & Jamie, Corrine, Adam, Kay Charlotte, Heiko and Anna for all their hard work in developing this theme. Special thanks to Maureen and David for hosting us! And of course, a huge thank you goes to Kay Charlotte for keeping us well fed and happy! You can read the official Theme Statement under the Themes tab or just click here: Exhale Inhale Theme. Keep your eyes peeled for more info! The Whole Theme Team… Including Dallas Thom of Idaho! 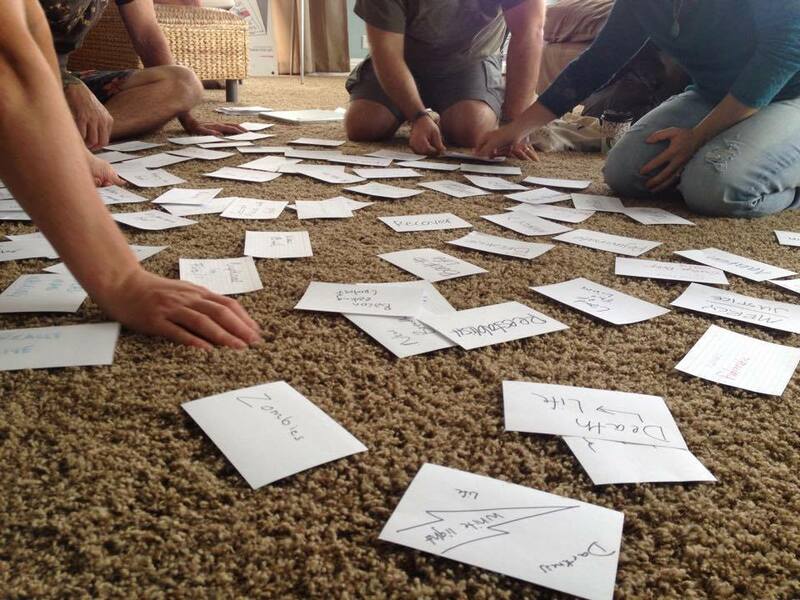 At the end of October, a group of us met in San Diego for a week of waiting on the Lord, and brainstorming for the North American theme for 2016. It was an amazing time! I'm so grateful for everyone who participated and for all those who prayed with us. The process this time had a couple of challenges, but we overcame them and I believe we have an awesome, God-inspired theme for the students who will participate with us next year! Stay tuned for more info, because we will announce the theme and release a theme statement soon! Participated in our Ministries Worldwide! Each of these individuals represents a life that God touched and a life that God used to touch others. Thank you for being a part of this ministry! Click Here for a PDF with Pretty Charts! MA Europe Theme Team Was Utrolig! We have just ended our Theme Team event where we waited on the Lord for a theme for European students for next summer. We had a great time in Oslo, the capital of Norway. There were twelve people from Russia, Norway, Romania and Switzerland. We had four intense days of prayer and talking about European teenagers with all their challenges and strengths. And through these days we landed the theme and we are super excited about it. We will announce it soon—stay tuned! The Mission Adventures Insider blog has been a very popular feature of MissionAdventures.net. But now it's time for a home of it's own. WAVES ‘15 In Rostrevor, Northern Ireland from Craig McClurg on Vimeo. A really big Thank You goes out to Masha Shulgin for taking most of these amazing pics. And thank you too, to the one and only Beth Konrath for sharing her pics too!